A workbench is one of the most important tools in the shop. A good bench should be flat, stable and heavy. Lie-Nielsen Workbenches feature simple design and solid construction. No skirt, no tool tray, just plenty of clamping surface. They are made of Hard Maple, a native hardwood that is stable, heavy and tough. Our benches come equipped with two rugged vises: our Chain-Drive Shoulder Vise, with 8" of travel, and our non-traditional, "no L-block" Tail Vise, with 6½" of travel. Benches are supplied with two vise handles and two wooden square bench dogs. Bench dog holes are along front edge. Dog holes are 1.150" x .950". Holdfast holes along front right leg and benchtop for a variety of work-holding options. Holdfast holes are ¾" diameter. Lie-Nielsen benches are finished with a 3 equal-part mixture of spar-varnish, boiled linseed oil and mineral spirits. This traditional finish seals the wood, but does not make it slippery. The finish will need to be renewed from time to time. Patent pending. 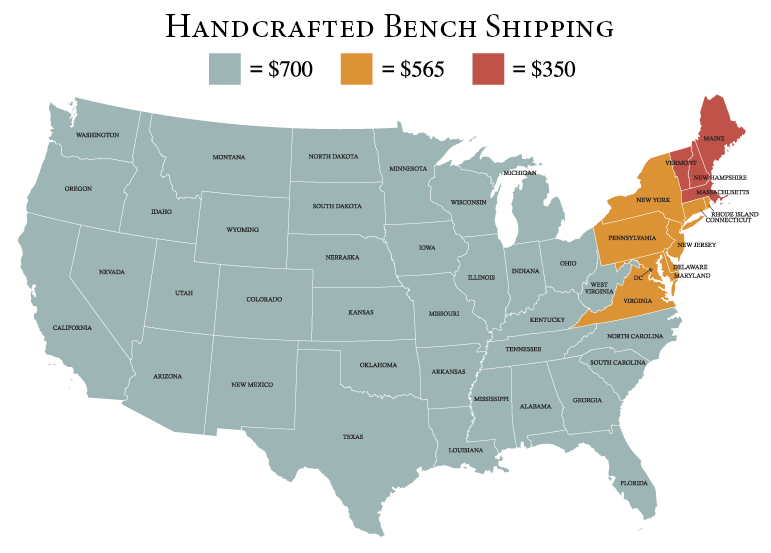 Please Note: Our benches are made in small batches and occasionally, depending on demand, are not in stock. Lead times vary and will be quoted when you place your order. Feel free to call us at 1-800-327-2520 or email toolworks@lie-nielsen.com with questions. Lie-Nielsen Workbenches are shipped via Handcrafted Delivery, a white glove service. Shipping rates are presented on the map and will be confirmed before your payment is processed. For orders shipping to Alaska, Hawaii, or international addresses, please contact our sales office for a freight shipping quote.